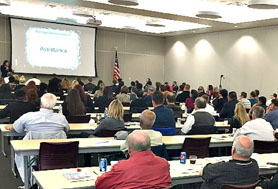 On Thursday, December 10, 2015, the 18th Annual Mortuary Science and Funeral Service (MSFS) Embalming Colloquium took place at the ASA Transportation Education Center (TEC). The Embalming Colloquium is the culmination of three semesters of embalming classes and is the final project for the senior students in the MSFS program. The event was attended by 30 funeral directors, 5 judges and about 80 MSFS students. Posters were judged from 7:30am - 8:30am and the power-point presentations started at 8:30am. In all, 27 students presented various embalming topics from obesity to polio. Lunch was provided by the Egyptian Funeral Directors Association, who also presented the winner a monetary award. The winner was Miss Kara Burgess, who presented on heroin overdose. The second place award, presented by Dodge Chemical Company was an embalming instrument kit. The runner-up was Miss Racheal Cochran who presented on Septicemia. The event was organized and ran by Mr. Abel Salazar, who is the instructor for the Advanced Embalming class, with the help from Anthony Fleege, Associate Professor and Program Director of MSFS, and other MSFS faculty members. This was a great opportunity for MSFS faculty and students to collaborate with the industry and the local community. Mr. Abel Salazar, Clinical Instructor of Mortuary Science and Funeral Services, shared a number of pictures of the professional conference with us. As shown below, two plaques were presented to the first-place winner, Kara Burges. The first plaque was for her to keep and the other plaque is to be displayed with the name of the winner in the mortuary science classroom. Dodge Chemicals sponsored the plaque and each year they will present it to the winner of the colloquium. Dodge also donated an embalming kit the MSFS program gave to the second place winner, Rachael Cochren. The Egyptian Funeral Directors Association (EFDA) presented the winner with a $100 check. Congratulations!